Mayor Catherine Pugh plans to use $18 million of “excess” city funds to pay for overtime at the Baltimore Police Department. Her action comes just months after she denounced the BPD for not controlling overtime spending and vowed to audit police overtime as soon as possible. 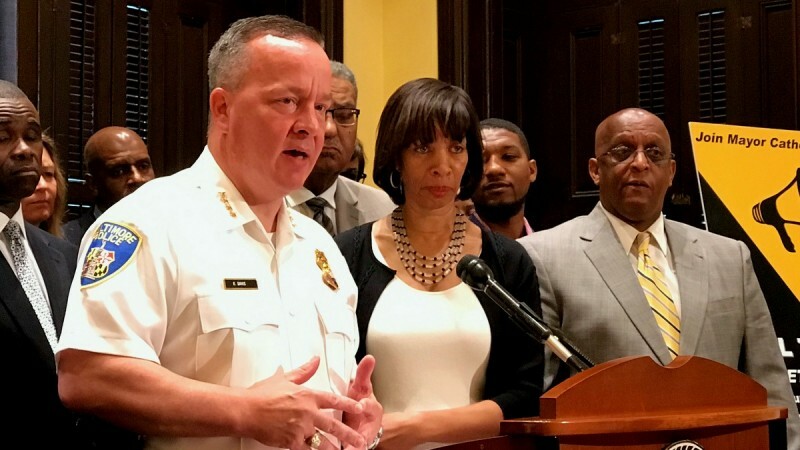 “We allow police overtime to run up when a lot of other areas of the city, like schools, housing and parks and recreation, could benefit from that money,” Pugh said in early March, responding to a federal indictment that charged seven officers of the Gun Trace Task Force with abuse of overtime as well as robbery, racketeering, false arrests and extortion. 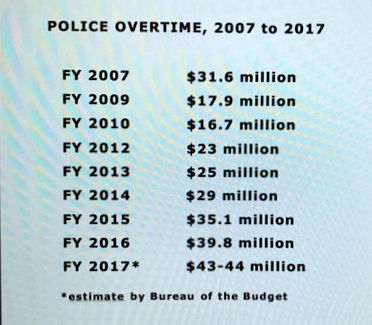 The promised audit of overtime has yet to begin, while tomorrow’s meeting of the Board of Estimates is set to shift the $18 million needed to “balance the books” before BPD’s fiscal year ends on June 30. Anthony McCarthy, the mayor’s spokesman, did not respond to questions about the money transfer or the status of the police audit. Two weeks ago, he told The Baltimore Sun that the city had identified a vendor and was “in the process of negotiating” a contract that has not yet come before the spending board. The funds for police will be drawn from an unexpected bounty of state income taxes distributed to the city and from a debt service reserve that was “not needed for the purpose for which it was appropriated,” according to the board’s agenda. The net effect is that City Hall will not be building up its “rainy day” fund for unexpected crises in the future. Nor will the income tax surplus be available for city schools and youth programs that were the source of last week’s showdown between the mayor and City Council. After the Council voted to cut the mayor’s 2018 budget, Pugh agreed to restore $4.2 million to after-school and Youth Violence Prevention programs next year. Beside the mayor’s audit promise – and an unmet pledge last March by City Council President Bernard C. “Jack” Young to redirect $10 million in police spending to city schools – elected officials have shown little inclination to tackle the issue of police spending. BPD already has a sizable overtime budget of $17 million. But actual spending is approaching the $43 million to $44 million mark this year, according to the city budget office. Discounting salary savings from unfilled police positions, the net cost is above $35 million, which is why the mayor needs to transfer the extra $18 million to police before the end of the month. Police overtime dropped during the Sheila Dixon administration, then mushroomed under Stephanie Rawlings-Blake. It shows no sign of going down under Mayor Pugh. The root causes of skyrocketing overtime are both simple and complex. They begin with the city’s relentless struggle with crime. Even though the current wave of violence dates back to before Freddie Gray’s death in April 2015, it has grown steadily worse since Gray’s death sparked protests and a night of rioting. The first five months of 2017, which coincide with the start of the Pugh administration, have been especially brutal. Including the six killings in Baltimore over the last 24 hours, there have been 159 homicides so far in 2017, or nearly 40% above the same period last year. Carjackings are up 35%, street robberies up 15%, burglaries up 17%, and total shootings up 7% from 2016, according to Comstat crime data. Police Commissioner Kevin Davis says he is trying to get as many officers as possible out on the streets. But retirements and a shortage of new recruits have hobbled his efforts. Other non-crime-related factors contribute to abundant police overtime. City officials acknowledge that a botched deployment strategy has contributed to overtime overruns. The strategy, negotiated in a 2014 contract with the Fraternal Order of Police, changed police shifts of eight hours a day to 10 hours for four days, followed by three days off. The new hours were designed to increase police presence during peak crime periods – and lower overtime costs – but the latter never happened. The new plan required a full complement of officers and better supervision, but the Rawlings-Blake administration decided to freeze 200 police positions in 2014 to recoup a pay raise for police. This was followed by another reduction in staffed ranks in 2015. So while the total number of officers dropped, the amount of overtime going to those who remained went up. Which gets to the core problem of lax accountability. Officers are generally free to self-report their overtime hours, with little guidance or review by supervising staff, which can lead to abuse. Last month, the police department charged Lt. Steven M. Bagshaw with earning fraudulent overtime while supervising the BPD unit assigned to the Horseshoe Casino district. Between April 1 and May 12, Bagshaw reportedly was paid $8,628 for time he was not working – often staying at his Eastern Shore home and using a department vehicle he was not authorized to drive. In fiscal 2016, Bagshaw pocketed $170,293 from the city, including $64,299 in overtime and $105,994 in regular salary, records show. He was suspended without pay on May 25 and released from custody on a $15,000 unsecured personal bond.